The Android 5.0 Lollipop is the most recent Android OS with an outstanding features. Most Android users, like the Nexus users and other android users must have upgraded to this recent operating system. If you have not upgraded to android 5.0 lollipop, then I advice you go through this tutorial on how to update the OS of any android device. For Nexus 4, 5 and 7 users, I already published a tutorial on how to install Android 5.0 Lollipop on Nexus 5 and Nexus 7. I also published a tutorial on how to install Android 5.0 Lollipop on Nexus 4 Smart phones. I advice you go through the guides mentioned above if you don't have Android 5.0 Lollipop installed on your android device. 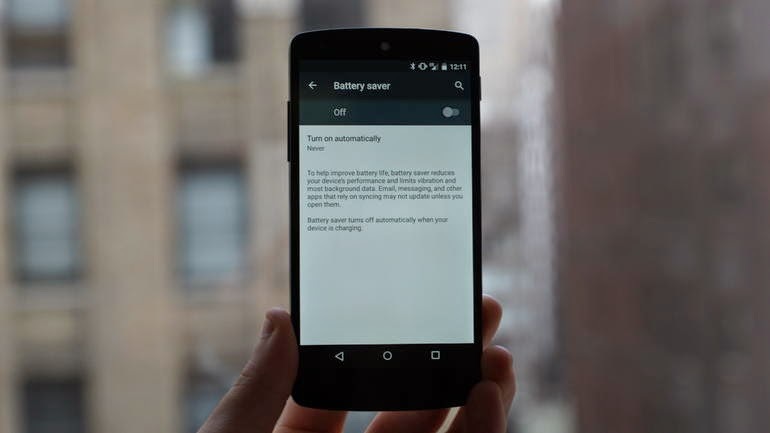 Today's stroll I would publish a brief guide to enable battery saver mode on Android 5.0 Lollipop. Reading through this guide means that you have already installed or upgraded to Android 5.0 Lollipop. If not, the above tutorials mentioned above is recommended for you. For those who have already installed or upgraded to Android 5.0 Lollipop, you can flow with me on this brief guide. “About battery saver: Whenever the battery saver mode is turned on, then all useless apps would be disabled. This also include apps that consumes battery regularly. To Enable battery saver mode, first move to your app drawer and tap Settings on your android 5.0 device. Then from the Settings Menu, tap on Battery option. vertical dots) and a drop-down menu would appear. Then, you are to choose the Battery saver option from there. Then simply swap it to the right, so that the battery saver mode would be enabled. 1. Never- Selecting this option means that you don't want to enable the battery saver mode. 2. 5%- Selecting this option means that, battery saver mode would be enabled after 5%. 3. 15%- Selecting this option means that, battery would be enabled after 15%. So select and of the options and that's it. Your battery saver mode would be activated. Hope this tutorial helps. For android users who still wishes to remain on the previous operating system of there android device, then you can check this tutorial about the 5 Best Android Apps that Extends your Battery Life. The tutorial would be very helpful. Very informative article. I liked it. Great point include in the post. Its good to know that you find the guide very interesting. When it comes OS, there is no doubt Android is leading the way but what leaves many Android users hanging is the fact that most their batteries don't last for long. I have a friend who always carries his phone charger with him anywhere he goes all because his Android phone wouldn't guarantee him battery life. Battery Saver HD - Battery saver, energy optimization and task killer to save battery.